If you clicked this story, or have any desire to listen to the interview embedded within, odds are you’re a consumer of independent media. Yet even as you’re reading these words, your ability to do so in a timely manner is in grave jeopardy. Since the repeal in June of Obama-era rules guaranteeing net neutrality, websites like Truthdig, Democracy Now!, Common Dreams and more risk being pushed into an internet slow lane that could severely hamper their readership, if not drive them out of business entirely. For Jeff Cohen, editor and co-founder of the media watchdog Fairness and Accuracy in Reporting(FAIR), it may be the most urgent threat to the First Amendment no one is talking about. Robert Scheer: Hi, this is Robert Scheer with another edition of Scheer Intelligence, where I hasten to add the intelligence comes from my guests. In this case, it’s Jeff Cohen. I think I most recently had seen you in action at the Democratic Convention in Philadelphia, and you were organizing sort of a grassroots activity. Of course I’ve known you for years, you—way back in the 1980s you started a group called FAIR, Fairness and Accuracy in Reporting, one of the major media watchdog organizations. And then more recently, in 2011, you organized RootsAction.org, and this very effective million and a half people who can push for progressive things. But the reason I wanted to talk to you is, I’m interviewing you the day after the midterm election, here at USC at the Annenberg School for Communication and Journalism. We had a lot of activity at the school, a lot of screens going all last night. Then everyone woke up this morning and not quite sure—there certainly wasn’t the blue wave, but there was blue impact; you get the House. And as I say, when I last saw you, it was a much more optimistic moment, in some sense, for progressives, but the tide was turning within the Democratic Party. And so take me back to the Philadelphia convention, and were you a Bernieite? Jeff Cohen: I was a spokesperson for the Bernie Delegates Network, which was an independent group of—that represented and networked most of the Bernie delegates; it was independent of the campaign. Were we more optimistic? Of course we were. Because even though there was the disappointment of Bernie not getting the nomination and the Clinton machine winning out, there was a sense for a while that Hillary Clinton, representing the corporate center, or the corporate liberals, would become president. The right wing would be totally divided and in disarray, because Trump had taken over, and if they had lost and lost big they would have been fighting each other. And there would have been this strong, organized left pushing on Hillary while the right is in disarray. That was the scenario that seemed possible in the summer of 2016. But what we learned last night, and what we learned back then, is that you can’t beat Trump with nothing. You can’t beat Trump by just saying, “Trump’s an ogre.” You have to have a program; you have to have a program that excites people. You have to have a program that excites your base, which is young people, people of color, and is sellable to working-class whites. And Bernie Sanders had that program; I’ve just finished a documentary where we interviewed union workers, former union workers in Youngstown, Ohio. Voted for Obama twice, voted for Bernie over Hillary in the 2016 primary, and then voted for Trump. And there’s lots of those people. So, what’s so disappointing about last night—and you say, was it a blue wave; it was like a blue trickle, or a blue ripple. It should have been a blue wave, but the only way you can have a blue wave is if the party stands for something. And the party has to stand for the progressive agenda that will be able to forge a multiracial alliance that can win elections, in middle-class districts, in working-class districts. We don’t have that, because of the leadership of the Democratic Party. It’s too indebted to the donor class. So they talk with mush in their mouths: “We should have more accessibility to affordable housing”—no! What’s popular is Medicare-for-all. A recent Pew poll showed that 51 percent of Republicans are for Medicare-for-all. Free, public college education, and pay for it by a transaction tax on Wall Street. The progressive domestic agenda—and I’ve just written a report on this with other people from RootsAction—it’s extremely popular, not just with progressives! It’s popular with people across the board. But the Democrats don’t put that agenda forward, and that’s why we had a trickle instead of a wave. RS: OK. But let me just ask, get back to basics here. And I want to establish your credentials here. RS: No, but you also have a good smile on your face. So I’m going to confess to you, as my priest. I had a very odd reaction this morning after, you know, the midterm election. Because I watched Donald Trump, and whatever you say about Donald Trump, he brought some energy and feeling to the situation. Now, you know, he’d gotten good news, bad news—you know, somehow there was, again as you suggest, a program. He was going to move ahead. And then I just now look at the screens, and he’s fired [laughs] the attorney general, and he’s going to move aggressively. And then they had Nancy Pelosi come on, and the question—you know, Trump actually endorsed her in his remarks. And I expected Nancy Pelosi to really stick it to this guy, you know? And—no! We’ve been empowered to come back here and really do something for ordinary people! And it was tepid at best, tepid. And it was like, oh, we’re going to save a notion of affordable health care. And she seemed as tone-deaf as Hillary was in the election. My feeling is, what Bernie Sanders brought was the same sort of energy—only it was a left populism—the same sort of energy that Donald Trump has. A progressive populism, as opposed to a reactionary, scapegoating of minorities, vulnerable people, and so forth. And I wonder, you know, you’ve spent the last months in midterm elections and everything; do you, is the Democratic Party really capable of feeling that pain? JC: No. Not in—not the current leadership. I mean, you’re right; the problem is Pelosi, the problem is Clinton, the problem is Schumer. After the disaster of 2016—and you’re right about my history, I go back decades in this. You know, we set up FAIR because progressive points of view were excluded from mainstream media. Typically in mainstream media—with some exceptions; you were one at the L.A. Times—typically, the spectrum went from the center to the right. So I spent decades trying to get the progressive view there. And I would tell executives, I’d have meetings with media executives, and I’d say: you know, if you had an unabashed progressive in some of these discussions, not only would it be good for democracy, but your ratings would go up. And so what was interesting with the Bernie campaign—and I’ve known Bernie since his first term in Congress—is for the first time, mainstream media was forced, because he had these huge rallies, to have the progressive agenda on the nightly news, every night, especially on cable news. And lo and behold, that progressive message connected with many voters, whether they know the term progressive or not. And again, talking to later Trump voters who voted for Bernie—I’ve met these people. So my whole life has been about trying to get progressive, the progressive message heard by the masses of people. And can the Democratic Party, as it’s currently led, win and defeat Trump, and then after you win an election, govern in a way that you can maintain power? Not with the current leadership. There’s two problems facing our country: one, you’ll hear about on MSNBC every night. It’s the extremism, the racism, the anti-science, the scapegoating of the Republicans. There’s an equal, second problem, and that’s the corporatism and the vacillation and the backpedaling of the Democratic Party. And if all you ever do is talk about that first problem, which is all they talk about hour after hour on MSNBC, you’re giving your viewers half of the story. Because the two things go together. So after the disaster of 2016, when the leadership of the party—this was one of the big calamities in U.S. history, when Trump won—they would not do an autopsy on what they had done wrong. They refused to do it, so we did it. And we put out this report called DemocraticAutopsy.org. What the Democratic leadership and MSNBC was content to do, was look at external factors. So they tried to blame it on Russia, is why they lost in November ; or the Comey intervention, 11 days before the election. These were small factors. But the major factor was within the control of the Democratic Party leadership, and that’s who they chose as their candidate; how they ran that campaign, how they spent their money—and remember, the Clintonites spent more money than the Trumpites in November, in the November 2016 election. So what, our critique of the Democratic Party leadership, and why they need to be replaced—and there will soon be campaigns to replace Schumer and Pelosi and Tom Perez, the leader of the Democratic National Committee—the reason they need to be replaced is they keep making two errors. One is agenda; they don’t have a progressive agenda, it’s mush, it’s tepid, as you said. And two, they don’t spend their money the right way. What you need to do is have a progressive agenda that creates a lot of enthusiasm among young people, people of color, even white working-class people. And then you have to spend your money to get your base out to the polls—that’s black people, Latinos, poor people, young people. Instead, they spend all this money on ads. RS: But we’re slipping into a language here of the Democrats as somehow being virtuous, if stumbling. And I just want to raise a question for you. Aren’t they really more perfectly, on economic matters, the party of Wall Street? And the result is, even in the ‘16 election, they got more support from Wall Street, and they got it in the midterm now; I haven’t done a clinical analysis of the stats. I want to ask you about this Democratic Party—maybe it is basically a con job, OK, that in fact, you’re deluding people. Most of my friends, most of the people I know, they’re part of the blue wave; I mean, in my own family everywhere, I have—I’ve got this all the time: we’re going to win, we’re going to resist. And the question is, isn’t there a message of false consciousness here? If we’re talking about a base that has working people, black people, brown people—those, that’s the group. College-educated black and brown people were the people hardest hit in the Great Recession, engineered by Robert Rubin, Lawrence Summers, Bill Clinton. You know, they lost 60, 70 percent of their wealth because of these liar loans, swindles and everything. That’s the base that you’re now going to tell they should give the Democrats another chance? JC: Well, you’re right in—you and I identify the base, but the leadership of the party is, as you say, allied with Wall Street. The Clintonites, the Obama—Obama got more money from Wall Street when he ran for president in 2008 before, in that campaign, before he was the frontrunner. And there were two New York candidates running for president, Giuliani and Hillary Clinton, and Obama was out-fundraising them before he was a frontrunner. So he was well connected, too. So the base of the party—we don’t have a parliamentary system, we don’t have proportional representation. We, at national and statewide levels, we’re reduced to two parties. And progressives need to take over the leadership of the Democratic Party. If it’s left in the hands of the Pelosis and the Schumers and the Tom Perezes, it’s hopeless. RS: OK, but you know, I like to dig a little deeper in these interviews. And you know, last night—oh, I got in trouble, not just last night, teaching a couple of times. And everyone from my wife to my former dean here, and other people—I said, look, if there are any kids in the room, any students who don’t feel they want to vote, you don’t have to. Now—debatable proposition. RS: Very debatable, but after all, we’re at a university, we’re supposed to do critical thinking, we’re supposed to challenge. And I was making a point to develop discussion and argument, you know. And I myself last night had my “I Voted” sticker on; you know, I dutifully went to my polling thing. But I thought, you know, wait a minute; wait a minute. Is this really a game that should absorb so much of our attention? Now, I’m putting the question to you because when I was at the Democratic Convention, you were an important figure to me as a journalist. I wanted to be where you were, the meetings and so forth, because they were the most interesting delegates, the Bernie delegates. They came from all over the country, they were idealistic, they were in touch with their own communities. And, lo and behold, they were betrayed. JC: Right, but if—you, I’m so glad you brought them up. If all they did was be Bernie delegates and work in the Bernie campaign, then yeah, I’d be disappointed. But the people you’re referring to that I got to know so well in Philadelphia, from every race, every age group, every gender—they’re movement-builders. These are people that work in organizations. They’re union-organizers, they’re tenant-organizers. So I don’t believe you register anything by not voting. But if all you do is work in elections, or you only get active two months before an election, you’re really not an activist. What you have to be doing is building independent organizations, and then also take those organizations and work electorally. But if all you do is electoral work, it’s cyclical; that’s not how you’re going to build a movement that could take over the Democratic Party and take over the country. The important thing is, where do we go? Is there a way of putting forward a progressive agenda and raising money for a presidential campaign or a big campaign? And I think Bernie Sanders proved, you don’t need Wall Street money. You don’t need corporate money. You can get $27 donations. Beto O’Rourke proved it. JC: He raised far more money than he needed. The problem with Bernie, between Bernie and Hillary had nothing to do with money. Same thing in Texas; Beto O’Rourke wouldn’t take PAC money, wouldn’t take corporate money. There’s a new wave within the Democratic Party, and that’s a—the progressive wave within the party is saying, if we have a progressive agenda, we can rebuild a multiracial alliance that will vote for us. And—thanks to the internet—we can raise money in small-dollar donations that we don’t need Wall Street money anymore. And I think that’s the way of the future; if people go to DemocraticAutopsy.org, you can see the critique we’ve made of the party leadership. And it was made by people—included in our writing team was the coordinator of the Bernie Delegates Network, Norman Solomon. It’s Karen Bernal, who you met in Philadelphia; she’s the head of the Progressive Caucus of the California Democratic Party, the biggest caucus. We have the chair of the New Mexico Progressive Caucus of the Democratic Party. So there is a wave within the Democratic Party that’s trying to take leadership away from the Clintonites. RS: Realistically speaking, when I think about American politics in general, there are two forces operating against what, say, Tom Paine—I’m not going to invoke the Founders. You had counterpower from the citizenry, counterpower, and that’s what the Bill of Rights and everything was going to give voice to. Now, you have a very different situation; you have MSNBC, which is supposed to be center-progressive media, but it’s owned by really one of the largest manipulative media companies, right, Comcast. Before that it was owned by a defense contractor and banker that was very instrumental in getting the whole banking meltdown, GE Capital. So they make a show of independence, but we all know there are limits, and when you work for those operations, what’s left of your newspapers are increasingly dependent upon billionaires. So when we think of the quality of our society, the debate it can sustain, it’s all very well and good to say, people are out there organizing movements and so forth. And I don’t want to be negative here; I want to encourage people to do that. But the fact is, we are living increasingly in a 1984 world. We have a surveillance state; we have a very refined degree of social control, manipulation, spying and the ability to coop people. And then you got two guys like us sitting here, ruminating about this election, and I wonder if we’re not burying the lede. The lede is, Donald Trump is not an accident; he is the norm in this manipulative society. He knows how to game the system, and, as Wall Street has shown with stock prices and everything else, they like it. JC: Yeah. Well, I—look, I can’t disagree with what you’ve been saying. I’ve been a leading critic of MSNBC; all they talk about is Russia, Russia, Mueller, Mueller, Mueller. Imagine if they talked about important things, like all the corporate corruption of Donald Trump. How that would have resonated with voters. He’s violating the Constitution. So MSNBC is a disaster to me. The biggest issue of freedom of the press is not that Trump is mean to reporters, as he was today with the CNN reporter and the NBC reporter. The biggest freedom of the press issue is that Trump is working with Comcast and AT&T and Verizon to end net neutrality, which would push Truthdig and Truthout and Common Dreams and Democracy Now! and The Young Turks into the slow lane. He’s working hand-in-glove with them. What issue do you never hear on Comcast-owned MSNBC about freedom of the press is the biggest freedom of the press debate going on now, which is saving net neutrality. They won’t talk about it. So you are right that the ownership of the media and the ownership of the internet, and the fact that these big internet providers are these few giant companies that also produce content—it’s very, very dangerous. But I’ve got to stay optimistic. What I’m optimistic about is, I study the polls. And the polls show that the most progressive demographic, by age, by far, are people under 30, under 35. They’re the most anti-racist demographic, they’re the most tax-the-rich demographic, they’re the most we-better-do-something-about-climate-change demographic. And so the young people, whether they’re college-educated or not, the polls I look at are all people under 30, are all people under 35. The problem is, do we have enough time left, given climate change and given Trump’s instability with his finger near the button—do we have time for a new generation of people? You and I saw that generation in Philadelphia; these were the Bernie delegates. So many of them were under 30. Look at all the people that were elected yesterday, who are under 35. I mean, I’m from New York; Alexandria Ocasio-Cortez is electrifying, and she beat the fourth most powerful Democrat in a primary. There are exciting things happening in spite of Wall Street’s influence over the Democratic Party. And, as you say, in spite of the billionaires dominating corporate media. 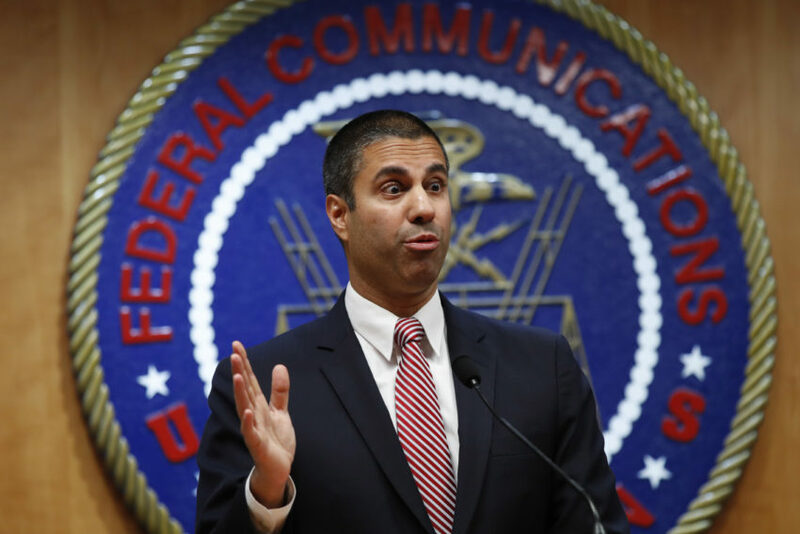 If we can save net neutrality, we still have these alternative avenues by which young people, especially, are getting independent news information. The downside of the internet is Trump sends his crazy tweets, and Breitbart sends its divisive crap that isn’t accurate or factual. You know, there’s an up and a down side. But I’ve studied independent media, and you’ve been a big part of it for half a century. And independent media is more powerful today than probably anytime in the last century. And it won’t be if Trump and Comcast, if they succeed in getting rid of the internet. You know, a free internet, an open internet. RS: I certainly agree that it’s important to fight the good fight. But we’re doing this on, well, being done from a public radio station. And it’s being done, we’re recording at a university. Our job here is to actually think out loud. Because I think the game is rigged now to such a degree that what we need are some naysayers out there. And I think of Martin Luther King, and when I was the editor of Ramparts we published him when The New York Times denounced him in an editorial, when he at Riverside Church, a year before he was killed, said the United States, my government, is the major purveyor of violence in the world today. That was not a statement that a careful politician would ever even think about; you would be denounced. Yet the United States, today, is the major purveyor of violence in the world today. It has a military budget that is growing all the time, supported by Democrats and Republicans; it intervenes everywhere in the world. And yet, if those good candidates that you’re talking about dared to say, my government is the major purveyor in the violence of the world today, they wouldn’t be treated—you know, let’s cut to the chase here. JC: Yeah, I agree. But let me respond. You’ve raised the most important issue that liberals won’t talk about, which is U.S. militarism. When Martin Luther King says the U.S. is the greatest purveyor of violence in the world today, if he were alive he’d be saying it, as you’re saying it, today. We have 800 military bases, $717 billion National Defense Authorization Act for 2019. And Schumer’s office, and Pelosi, sent out statements about how they were working with Trump to get him the money for our quote defense, unquote. Most Democrats, even progressive ones, on their websites—check out the issues I’m running on—they’ll mention gay rights, they’ll mention health care, they’ll mention environment. They don’t mention the military. They don’t mention endless war. We’ve been involved in war since 2001. It’s the longest war in U.S. history, and they won’t talk about it. But here’s the good news. Alexandria Ocasio-Cortez; Rashida Tlaib, who’s the new congresswoman, a Palestinian-American from Detroit; Ilhan Omar, the Somali refugee, is the new congresswoman from Minnesota; Ayanna Pressley, she beat a 10-term Democrat in the primary, she’s from Boston. On their websites, they talk about cutting the military budget and using that money for social good. If you don’t cut the military budget, how can we provide free, public college education? How can we provide the kind of healthcare that the country needs? So you’re right, you’re right—it’s the biggest issue that the mainstream media won’t talk about, MSNBC doesn’t talk about it. But some of these—obviously, Truthdig talks about it, Truthout talks about it, Democracy Now! talks about it. MSNBC—they don’t talk about, there’s no such thing as U.S. militarism or U.S. imperialism on those stations. JC: And Obama had eight years to fix it himself and did not. RS: Yeah. And for the first time, there’s actually some consideration of what is fair wage, and actually letting the courts of Mexico and Canada have some, and America, have some say over whether the treaty is agreeing. I think—North Korea, and so forth. Where he’s really quite dangerous, ironically, is the Russia stuff; he keeps putting sanctions on Russia, he doesn’t take advantage of his conversation with Putin to actually have arms control; he’s just ripped up—not one question today about, at a press conference, about his ripping up arms control on intermediate nuclear weapons. Very, very serious. But I want to end this by saying, none of the people you talk about will talk about the main foreign interference in this election, and it was Israel. And the pivot, the most dangerous thing Trump has done in foreign policy, the most dangerous thing he’s done on domestic policy is the scapegoating of vulnerable people, particularly immigrants. It’s horrible, and it has echoes, strong echoes of fascism, attacking the most vulnerable people. But on foreign policy, and they are related, the real danger is accepting this alliance between Saudi Arabia and Israel, and the idea that Iran, which did not attack the World Trade Center, that somehow Iran is the major problem, and we seem to be heading toward some kind of confrontation with Iran, despite the French, the Germans, the Russians, the Chinese all saying this is nuts, they are honoring the agreement. And you don’t hear anybody talk about it. Now, the president brought it up at his press conference. He said, don’t attack me; he said, Netanyahu has said I’m the greatest thing for world peace. That was the key thing he said at his most important press conference. No one in the media challenged him on that. JC: Let me react. Yeah. Israel is an untouchable topic in the mainstream media. We know it. People have lost so many jobs over criticism of Israel. And it was a factor when I worked with Phil Donahue at MSNBC, why we got in trouble with management. Because we questioned Israel’s actions. That’s a given. But in terms of Trump, I think you’ve nailed it. I mean, he has an amazing ability to connect with his audience. It’s a white audience; he tells him he loves them; he makes jokes; he’ll talk in very non-politician-like ways. There’s no doubt, he’s got a mastery of mainstream media. He’s got a mastery of television. I mean, when I look at the, who’s to blame for the rise of Trump, you’ve got Jeff Zucker, was the president of NBC entertainment, that created “The Apprentice” for that ego known as Donald Trump. And then he moves over to CNN, and you remember in 2015 and the first months of 2016, at CNN they had basically an all-Trump-all-the-time policy. So Trump is a master of television, and I think he does have this connection to an audience that most Democratic politicians, with their vacillation and their talking with mush in their mouths, don’t have. But you know, there’s so many issues that you mentioned that should be in the national news, and on MSNBC and CNN it was Russia, Russia, Mueller, Mueller, Mueller. You know, FAIR did a survey and they found—this was in July of this year—not one segment on MSNBC on the U.S. role in the massacre in Yemen, the humanitarian crisis, U.S. and Saudi Arabia killing so many civilians. But while zero segments on Yemen, 465 segments mentioning Stormy Daniels. So I mean, we have a real failure in so-called liberal media and what they cover. And Iran and Israel—I mean, it’s a powder keg. You’re right, it’s a common thing, even at The New York Times, which is, you know, can be a strong newspaper. But they have this cliché about Iran as the main state sponsor of terrorism in the world. We know that’s not true, every expert knows it’s not true. Saudi Arabia is the main sponsor. And as you say, we weren’t attacked on September 11th by Iran; quite the contrary. So what I try to get people to do—and 10 years at Ithaca College, my field of study was independent media—divorce yourself from corporate, mainstream media and start really digging into the best independent outlets. We’ve really had a boom in independent media. But all of these critiques you’re making of the political system, and the media system, I agree with. But I guess I have hope for a new generation, and a new generation with a new, independent media that’s been booming. JC: One day it’s going to be someone’s—yeah, one day it will be. RS: Well, that’s it for this edition of Scheer Intelligence. Our producers are Josh Scheer and Isabel Carreon. Our engineers at KCRW are Kat Yore and Mario Diaz. And here at the Annenberg School for Communication and Journalism at University of Southern California, Sebastian Grubaugh has been the man on the board. That’s it, see you next week.